The OOI cruise also happened to be Tamsitt’s first mooring deployment cruise. With her interest piqued, Tamsitt embraced the mooring data while on board and helped to validate it. She came away from the cruise with a brand-new dataset that no one seemed to be looking at yet–air-sea heat flux from the Southern Ocean Surface Mooring. Even though these data were a side project to her main dissertation objectives, Tamsitt knew she could not pass it up. Over the next two summers, Tamsitt worked with an undergraduate student in the Talley laboratory, Sarah Ogle, from Carleton College in Minnesota as she analyzed the dataset. “We lucked out with Sarah, she was a San Diego native coming home every summer to help us on this project,” Tamsitt reflected. 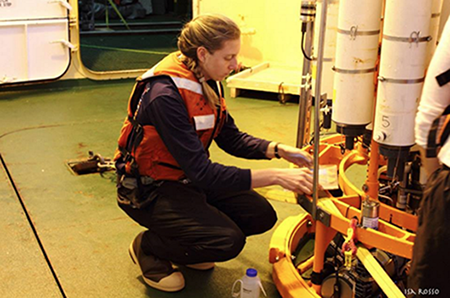 For her post-doctoral work, Tamsitt will be comparing data from the OOI with the other Southern Ocean mooring, deployed southwest of Tasmania, the Southern Ocean Time Series Observatory (SOTS). Both moorings are in regions of deep water mixing and regions where water mass formation is really important for heat and carbon uptake, however, these regions differ greatly when it comes to El Niño. 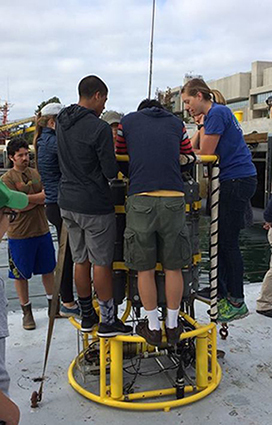 “By comparing these two moorings we are trying to understand how air-sea heat exchange and winter mixing are influenced by El Niño,” said Tamsitt. In terms of her next steps, Tamsitt is interested in continuing her research, but also sees the need to connect research to policy makers. After all, she did help develop a two-week intensive environmental science and policy course for high school students through the University of California San Diego Academic Connections – Global Environmental Leadership & Sustainability Washington DC. Whatever direction she heads in, it is clear that Tamsitt’s future is going to have a lot of opportunities, and it is also clear that she is going to make the most of them. 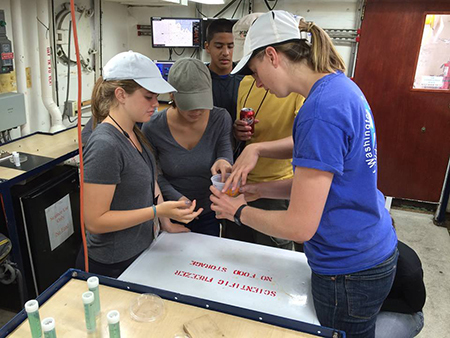 Story adapted from an Ocean Observatories Initiative feature.